To improve the Baltic Sea Region-wide cooperation between design centres, promoting ecodesign "Made in the Baltic Sea Region"
We want to support and facilitate cooperation among design centres to help their clients drive forwards the circular economy. Enterprise managers, designers and lecturers can use this easily accessible transnational hub of information, inspiration and methods for ecodesign. Find insipiration and motivation during this touring exhibition and accompanying workshops. We´ll show great cases from the Baltic Sea Region and demonstrate the market potential of ecodesign. Bridge the gap between environmental science, design thinking and business reality - learn as professional designers, engineers or lecturers how to eco-design circular systems. Use our films and teaching materials to bring reality into (ecodesign) education. We offer and show a way for enterprises and public sector organisations to evaluate design sustainability and integrate into the circular economy. We support enterprises and designers in developing new ecodesign products / services for changed consumer needs. Have a look at this short movie produced by the Lithuanian Design Forum. 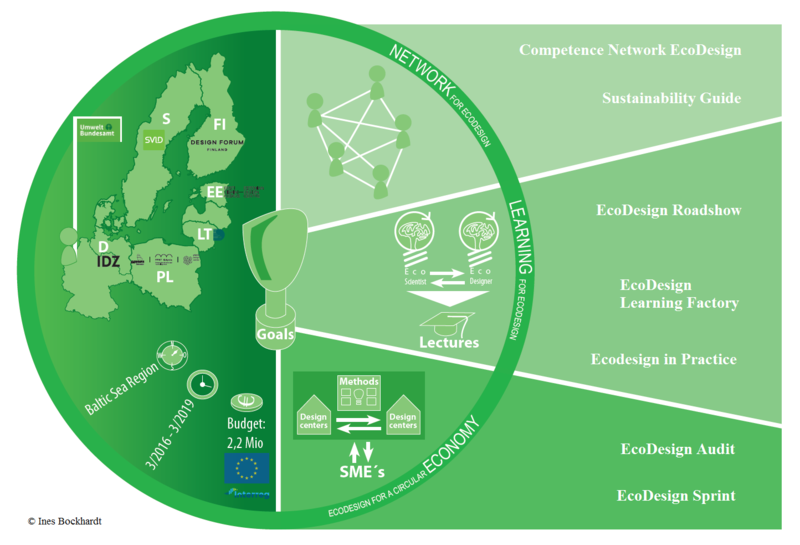 It shows small impressions from our Roadshow, the EcoDesign Learning Factory and our Closure Conference in Lithuania.